Have you wondered if cosmetic dentistry has the solutions you need? Thomas J. Machnowski DDS in Woodbridge, IL is a cosmetic dentist offering a comprehensive range of solutions, and though they focus on aesthetics, you cannot ignore the fact that they will boost your self-esteem and even improve the function of your mouth. 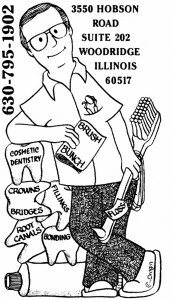 It helps to understand that cosmetic dentistry is an area of specialization that emphasizes the appearance of the teeth and gums, but as your preferred dentist in Woodbridge, IL, we begin on a foundation of oral health. Part of the cosmetic dentistry offered includes exams and cleanings that ensure your teeth and gums are in the best condition possible. We would not offer you something like teeth whitening if you had a need for a filling or preventative care. As you can see from that list, a tooth that is unattractive may be so because it has been somehow compromised. For instance, you may want cosmetic dentistry because of a deeply discolored tooth that will not respond to whitening. This could be remedied with something like a porcelain veneer. Of course, you may seek our cosmetic treatments because you have a tooth that is chipped or cracked. We can also solve this with the veneer, through bonding, or a dental crown. Interestingly enough, this cosmetic treatment would also work as a restorative treatment. It would strengthen the tooth and prevent it from sustaining further harm. Keeping your natural teeth is an important part of long-term oral health, and so we would encourage you to consider addressing cosmetic needs as part of an overall healthier smile! We make the latest technologies available, and we encourage patients to meet with us to consult about the best options for their goals. Cosmetic dental solutions are not about vanity, or purely aesthetic. They relate to your self-esteem and oral health. If you hide your healthy grin because you dislike the way it looks, it is time to discuss this matter with us, and learn about the many ways we can improve the situation. It may be much easier than you think, and far more affordable than ever before. Technologies have advanced greatly in the past decades, and today you can enjoy a much more attractive smile in just a few office visits. If you have additional questions about cosmetic dentistry, or about any of the other treatments mentioned here, give us a call at our Woodridge, IL office at 630-795-1902. You can also use our online contact form and one of our staff will get back to you promptly.